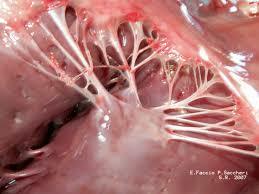 Chordae tendineae are approximately 80% collagen, while the remaining 20% is made up of elastin and endothelial cells. During atrial systole, blood flows from the atria to the ventricles down the pressure gradient. Chordae tendineae are relaxed because the atrioventricular valves are forced open. When the ventricles of the heart contract in ventricular systole, the increased blood pressures in both chambers push the AV valves to close simultaneously, preventing backflow of blood into the atria. Since the blood pressure in atria is much lower than that in the ventricles, the flaps attempt to evert to the low pressure regions. The chordae tendineae prevent the eversion, prolapse, by becoming tense thus pulling the flaps, holding them in closed position.